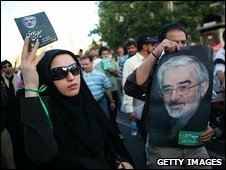 More mass protests are expected in the Iranian capital after presidential challenger Mir Hossein Mousavi urged followers to observe a day of mourning. Mr Mousavi has called on supporters to stage peaceful protests or gather at mosques in memory of eight people killed after a Tehran rally on Monday. He has also called for the release of a growing number of pro-reform activists. The top legislative body has invited the three defeated candidates to a meeting on Saturday, state radio says. Mr Mousavi, fellow reformist Mehdi Karroubi and conservative Mohsen Rezai had been asked to attend an extraordinary session of the Guardian Council to "discuss their issues with the members", a spokesman said. The council had begun a "careful examination" of the 646 complaints submitted over the results, he added. The council earlier this week said it would carry out a partial recount, but had ruled out a re-run of the poll demanded by Mr Mousavi. President Mahmoud Ahmadinejad was re-elected with almost two-thirds of the votes on 12 June, but the opposition claims there was widespread fraud. Mr Mousavi is urging his followers to wear black at Thursday's protests in mourning for those shot by members of the pro-government Basij volunteer militia on Monday. The crisis in Iran has moved far beyond a dispute over election results. It has turned into a struggle over the balance of power in the country, and Iran's future orientation. That balance is being fought over in a symbiotic struggle that is taking place both behind the political scenes and, through rival displays of people power, on the streets of Tehran and other cities. Years of contradictions have come to a head in the current crisis. The Iranian leadership has in the past shown ingenuity and flexibility in facing serious challenges. This is probably greater than any, and it goes to the heart of the system. It is unlikely to be easily or quickly resolved. He and reformist former President Mohammad Khatami have sent a joint letter to the head of the judiciary asking for an end to "the violent actions against people and to free those arrested". Heavy restrictions have been placed on the BBC and other foreign news organisations. Reporters are not allowed to cover unauthorised gatherings or move around freely in Tehran - but there are no controls over what they can write or say. The gatherings are expected to draw even larger numbers than a rally on Wednesday, which saw tens of thousands of people march in silence through the centre of Tehran. Estimates put the number of protesters at between 70,000 and 500,000. Mr Mousavi's call for further action on Thursday is in open defiance of Supreme Leader Ayatollah Ali Khamenei, who is due to deliver the sermon at Friday prayers and is expected to appeal for calm. Meanwhile, the Iranian government complained to foreign ambassadors on Wednesday about what it called "meddlesome" and "impertinent" comments made about Iran's internal affairs. Among those summoned to the foreign ministry was the Swiss envoy who represents US interests in Iran. Iranian officials complained about Washington's "interventionist approach" on the election issue, but the White House has denied the accusation. Iranian authorities have also rounded up pro-reform figures and tried to further muzzle web sites and social networks used by opposition supporters to broadcast information and images of events in Tehran. 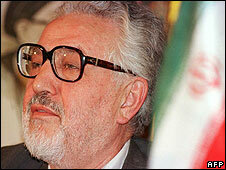 Ebrahim Yazdi, a foreign minister after the 1979 revolution and now leader of the Freedom Movement of Iran, was arrested while undergoing tests at a hospital in Tehran, a spokesman for his organisation said. In another show of defiance on Wednesday, six footballers playing for Iran's national team appeared in a World Cup qualifier in Seoul, South Korea, wearing armbands in the green associated with Mr Mousavi. The BBC's Jon Leyne says the disputed election has stirred up strong feelings in a population frustrated about a government and a system that fails to meet their aspirations.